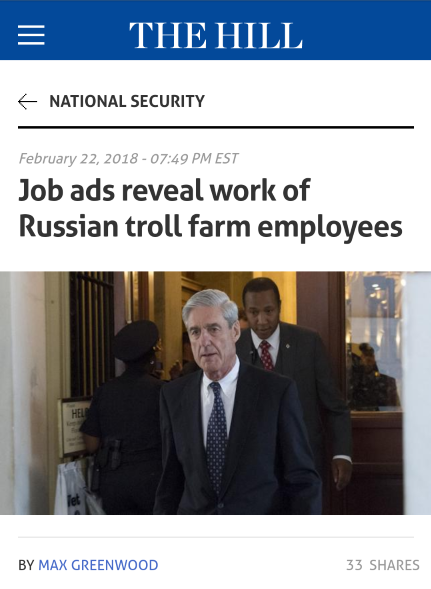 Yesterday, I blogged that the recently indicted Russian troll factory, Internet Research Agency (IRA), recruited its U.S. election-meddling troll army of “kremlebots” via conspicuous online job ads, then allegedly expected successful applicants to work for free. Today, BuzzFeed picked-up the story. The Internet Research Agency, now commonly known as the Russian troll factory, has gained international fame for its work during the 2016 US election, and the resulting indictments of 13 people announced by the Department of Justice last week. Job ads from the IRA posted before the election give a sense of the kind of person the agency was looking for and how it helped weed out candidates. The ads were posted on Russian employment websites in 2014 and 2015 and the address listed in them matches the known location of the IRA’s headquarters. The blog Shooting the Messenger first posted some of the job ads. One ad posting was for a social media specialist, offering a monthly salary of 40,000 rubles, or about $700. The responsibilities included preparing “thematic posts,” publishing content, growing social audiences, and monitoring social media, blogs, and groups. 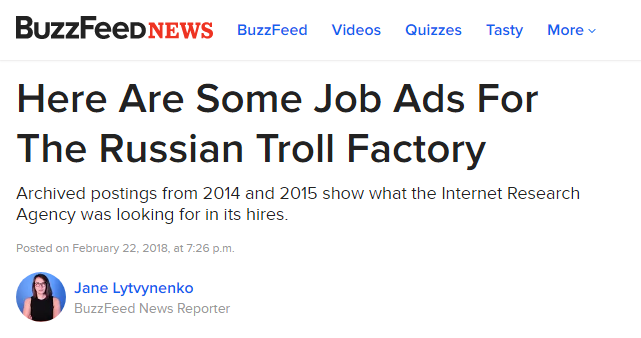 But with job postings come job reviews, and one reviewed by BuzzFeed News was not positive about work at the troll factory. The review, from 2014, complained about being asked to do unpaid work for two days before being hired. “The company invites you for the content manager for a vacancy, they give you a test task, when you do it, they invite you to an internship, 2 days for 8 hours. When you try to hint that it’s already full-time work and it would be nice to negotiate the terms of the employment contract, you hear ‘I’m sorry, you’re not a good fit’ in return,” the reviewer wrote said. They wrote that that the other candidates doing the “internship” were largely between 18 and 20 years. The job listings for the St. Petersburg-based Internet Research Agency were placed on Russian employment websites in 2014 and 2015, BuzzFeed News reported Thursday. Some of the listings first surfaced on a blog Wednesday. One listing for a social media specialist position advertised a monthly salary of 40,000 rubles – about $700 – and said the job would require composing “thematic posts,” monitoring social media and growing social followings, according to BuzzFeed.